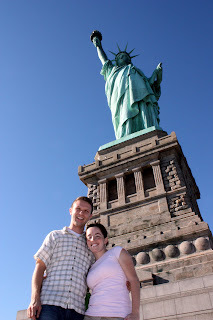 Right after Reini landed, we went to the Empire State Building. We were there for sunset and got to see all the city lights turn on. This amazing green rectangle! And... Blobs of paint on a canvas! And, our favorite piece... A GIANT balloon wiener dog!!! Later that day we also went to the Museum of Natural History and ate at a great little restaurant just down the street. We also walked by the New York LDS Temple. We walked in the lobby and were amazed at how strong the contrast was of the hustle of the city and the peace and spirit of the temple. The following day we got tickets to the musical Spamalot. It was hilarious and very well done. One of the main rolls was performed by Clay Aiken. And, if you look close, Jared had a supporting role! After the show, Reini had Clay Aiken autograph her play bill. We were pretty excited to have seen Clay Aiken, but little did we know that we would end up running into a LOT of famous people that night, including Morgan Freeman AND... Robin Williams... Jared even got a picture with President Bush! And, his luck got a little better when Jennifer Lopez let him snap a photo with her! And look at him cupping a feel! Okay, okay, we are not this lucky in one night. We did in fact see Clay Aiken, but after that we went to Madame Tussaud's Wax Museum. It was incredible how real they all looked. It was like we were invited to a Hollywood Party. 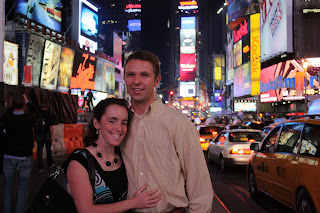 Another picture of Times Square. Because it's awesome! The next day we went on a bike ride in Central Park. During our ride, we took a detour so we could see the Restaurant that Seinfeld was filmed at. 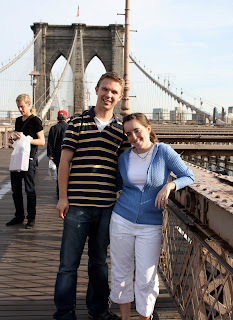 The Brooklyn Bridge The highlight of our trip! We got standby tickets for a taping of the Late Show with David Letterman. We waited in the standby line and got the LAST two seats in the theater! We were lucky! It was so much fun to see the show in person. Dave came out before the show started and answered a few questions, then the show began. Tina Fey was his main guest, followed by a comedian and a band. It was a blast! After the show, Jared got a picture with Paul Shaffer of the CBS Orchestra (by the way, the CBS Orchestra plays during the commercials and are fantastic!). We got up early Tuesday morning before our fight and went to see the Today show. The anchors were really nice and kept talking to the crowd. At one point, Reini called her mom and had Meredith talk to her. It sure surprised Reini's mom! 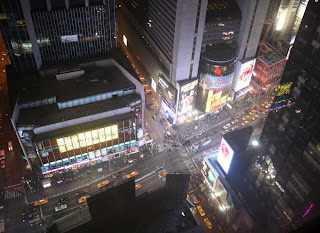 Our exceptional view from the 48th floor of the Millennium Hotel overlooking Times Square. I just wanted to tell my wonderful husband how much I love & adore him. He is my world! He continuley amazes me with his optimistic outlook on life, his dedication to the Lord, his strong work ethic, his warming smile, and the ability he has to make me feel so special. I am very blessed and honored to be his wife! You have all heard the saying, "An apple a day keeps the doctor away." Well in my case, an apple is a case for a visit to the ER. I was at work this week, enjoying lunch with some of my coworkers, eating my apple, when I noticed I was having a difficult time breathing- a piece of apple was stuck in my throat! I did everything I could to relieve the apple, but nothing was working. The charge nurse had Ashley and Liz take me to the ER. After two hours, the pain was finally relieved. An IV was placed and I was given a hypoglycemic agent, which was supposed to work in 45 sec. Needless to say, after 5 minutes the apple was still stuck and I was having a harder time breathing. The nurse then gave me Nitroglycerin, hoping that it would relax all of my veins/arteries and allow the apple to dislodge; if that didn't work, I would then be sent to endoscopy. As soon as the Nitro dissolved under my tongue, the apple dropped! It was so cool- I am still pretty excited about how quickly it worked! Luckily, I work at a hospital because the ER has served me well this year!